This tutorial contains instructions to resolve the following error in Windows 10, 8 or 7 OS. "The Application was unable to start correctly, (0xC0000142). Click OK to close the application". The error 0xc0000142 commonly occurs when you try to launch an outdated or corrupted program and in most cases the solution to resolve the error 0xc0000142, is to update the program in which the error occurs. In other cases, the 0xc0000142 problem can be caused by a virus infection, due to problematic graphics card drivers, or because a Windows update has not installed correctly. In this tutorial you 'll find several methods to fix the error 0xC0000142: Application was unable to start correctly, in Windows 10, 8/8.1 & 7 OS. Suggestion: Before troubleshooting any issues on your PC, first make sure that the problems persists, even after restarting your computer and installing all available updates. Additionally make sure that your security software doesn't prevent programs from running. Method 1. Uninstall Latest Updates. Important: If you receive the error 0xc0000142 after installing updates, then proceed and uninstall the latest updates, or restore your PC to a previous working state. Method 2: Run the Application in Compatibility Mode. 1. Right click at the application and select Properties. a. 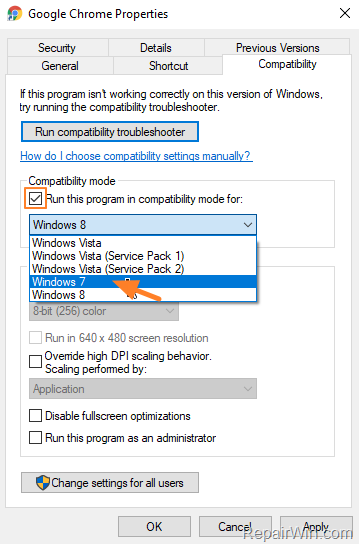 Check the Run this program in compatibility mode checkbox. c. Click OK to apply changes. 3. Now check if the application works. Method 3. Scan your system for Viruses and Malware. The second step before troubleshooting the error 0xC0000142 "Application was unable to start correctly", is to ensure that your system is virus/malware free. For that task follow the instructions in this guide: How To Scan Your Computer for Viruses and other Malicious Programs. Method 4. Update or Reinstall the program. The third solution to resolve the "Application was Unable to Start correctly" issue, is to install the most recent version of the application that causing the problem. If after updating the application, the problem persists, then completely uninstall the application from your system and then reinstall it. Method 5. Update Graphic Card Drivers. The next method to fix the error 0xC0000142, is to update the drivers of your Graphic Card (VGA). So, navigate to your VGA's vendor support site to download and install the most recent version of the VGA driver. Method 6. Check Registry Settings. Verify that the registry has not been incorrectly modified by another program. 2. 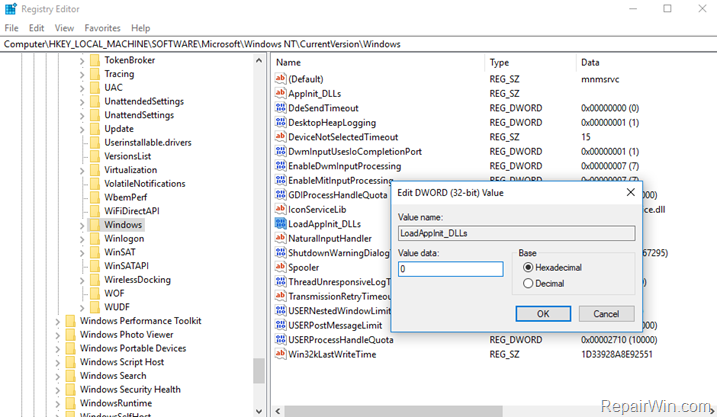 In the Search box, type regedit and press Enter to launch the Registry Editor. 3. At the right pane double click at LoadAppInit_DLLs value. 4. Change the value data to 0 and click OK. Method 7. Start Windows in Clean Boot State. 2. 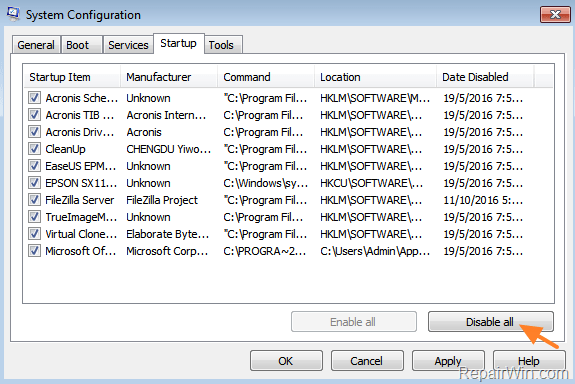 In the Search box, type: msconfig & click OK to launch the System Configuration utility. 3. 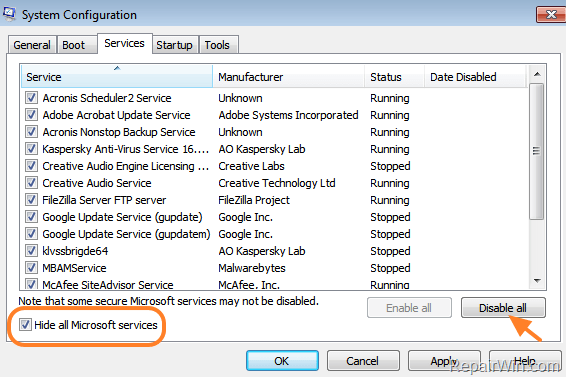 At Services tab, Hide all Microsoft Services checkbox and then press the Disable Allbutton, to prevent all non Microsoft services from starting at Windows startup.